For the six years of the recession households were paying down debts and increasing their debt to income ratios (deleveraging) which can not have been easy since incomes were falling with respect to prices. But in 2014 this turned around. We can see from the blue line that the debt to income ration climbed from 1998-2010 from ca. 110% to about 170%. Then for six years it dropped back to about 145%. Now the blue line is rising again, not by a huge amount, but rising. No doubt rising housing costs have had something to do with this. The government's strategy for prosperity has been to inflate asset prices (particularly housing). CPI inflation is currently 0% while house price inflation is currently over 8%. 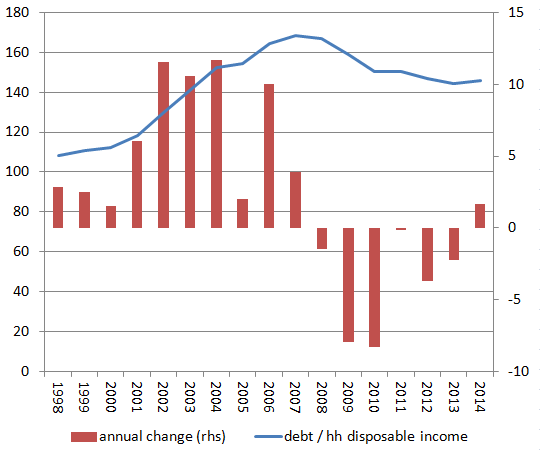 The problem with rising debt, which is ignored in the mainstream, is that the repayments soak up disposable income. When disposable income is no longer disposable the demand for commodities slows. Growth fuelled by rising debt is bad for the reason that we saw in 2008. On the other hand, if the mainstream politicians want us to believe that the nation's finances should be run like a household and spending beyond our means is a disaster, then this is problematic by that criteria as well. Household debt/income is currently double government debt/GDP. The mainstream argument is that at 80% debt/GDP we need to cut spending and "live within our means" then why is the message so different for households? How can the rise in debt, caused by inflating house-prices, be a good thing if it creates an increasing household balance of payment deficit? From whatever angle we look at it the level of household debt is extremely worrying. Tying the Hands of Europe's Politicians.